It’s that time of the year again! And this year I am going to blissfully enjoy the fact I’m not going to be in the boxes this year. No moving 4 days before Christmas this year, no tensions, no hundred people visiting the flat at all odd hour, no feeling beat on Christmas day after 4 days straight of packing and unpacking…ah!!!!! 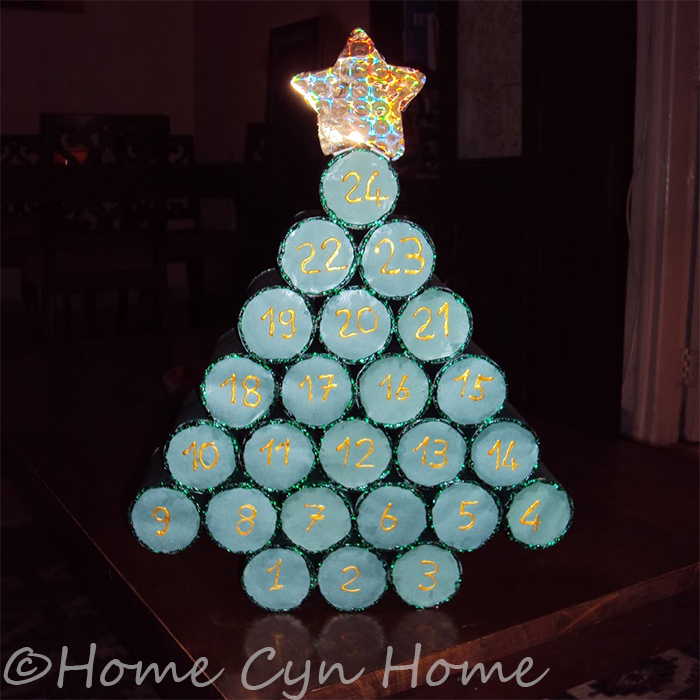 This year I decided to do another toilet paper roll tree advent calendar in the shape of a tree, simply because that looks really nice, and this year I planned better, not having to cut kitchen tissue rolls to size and buying all my TP in one brand to get the same diameter of rolls, making a more even tree in the process. I filled it with stickers, chocolate and little art supplies this year, no plastic trinkets I will end up stepping on, no hair clips that will get lost a few month later. I wanted to put that blog post up on Sunday, but we are having some internet connection glitches, and I am currently on DH’s Tata Photon rather than our home connection. Yesterday we also spent all afternoon at the mall, with the initial plan of getting a yellow t-shirt for Ishita’s yellow day in school (which was today) but ended giving the car for a full inside out clean up and enjoyed some coffee and cake in Starbucks…where I fell in love with yet another of their seasonal coffee…move over Pumpkin Spice Latte, you’ve been bested by Praline Mocha! On these words I’ll leave, the airtel guy is her to fix my connection. Oh stop with the praline latte at Starbucks! All we have here in Nepal is boring old Lavazza's. Although I do find Starbucks to be a bot too sweet for my taste at times. I nominated you as one of my favorite bloggers!